Bodies were found hanging from bridges in Baja California Sur several days before Christmas, along with banners known as narcomantas. Such displays were common during previous times of inter-cartel fighting, but it’s the first time one has appeared in Baja California Sur. During the early-morning hours of December 20, the bodies of six men were found hanging from bridges in the northwestern Mexican state of Baja California Sur, a popular tourist hub where deadly violence has risen precipitously in recent years. At about 4:30 a.m., two bodies were found hanging from a bridge near the international airport in the municipality of Los Cabos, at the southern end of the state. At about 5 a.m., two more bodies were found in Cabo San Lucas, hanging from a bridge over a highway connecting that city to San Jose del Cabo. At about 6 a.m., another two bodies were found hanging from a highway bridge near the international airport in the capital, La Paz, which is north of Los Cabos. 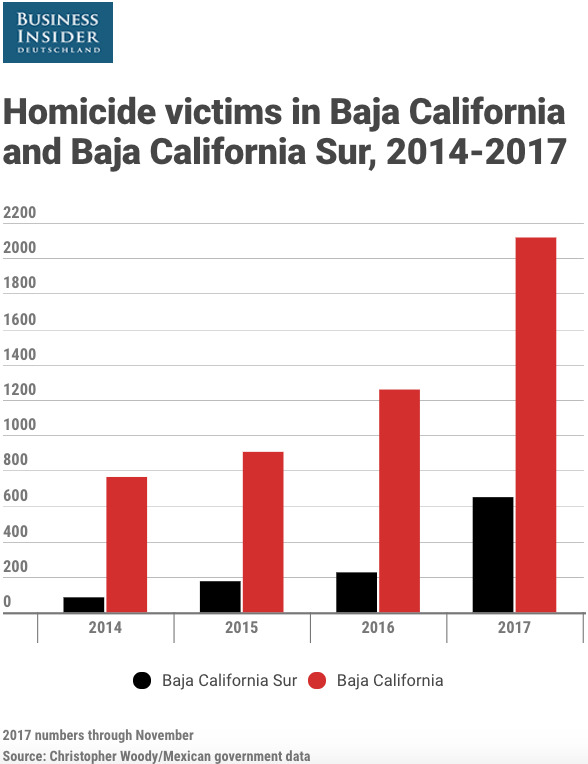 There has been a sharp increase in violence – much of it attributed to fighting among organised-crime groups – in Baja California Sur over the past three years. The 650 homicide victims in the state from January to November of this year marked 223% and 284% increases over the same periods in 2016 and 2015. Narcomantas – public announcements by criminals that often accompany corpses – were left with the bodies. Several such signs have been attributed to the gang over the past two months, threatening government officials and boasting of “a cleansing” in the area. A sign attributed to the group also appeared in the days after Baja California Sur’s human-rights ombudsman and his son were gunned down in late November. The gang’s name appears to refer to Tegoripa, a small town in the Sinaloa state’s Badiraguato municipality, which is where the Sinaloa cartel chief Joaquín “El Chapo” Guzmán was born. Guzmán’s surname appears to be the basis for the other half of the gang’s name. Several such displays were found around Tijuana in late 2016, and a body was hung from a bridge in the nearby Nayarit state a few days before the incident in Baja California Sur, part of a wave of killings in the state thought to be related to organised crime. Narcomantas were found at the scene of several of those crimes, including at the bridge. Tourist hubs like Los Cabos have long avoided the kind of bloodshed seen elsewhere in the country during the past decade of its drug war. Amid the dizzying increase in homicides through Baja California, the Los Cabos municipality, home to Cabo San Lucas, has also seen a spike: from 49 homicide cases (which can contain more than one victim) through all of 2016 to 286 through the first 11 months of this year – a 483% increase. 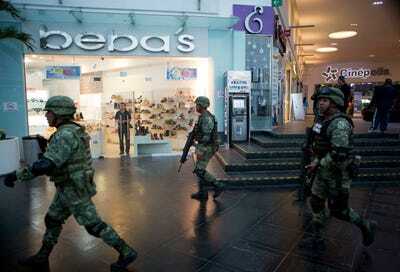 (AP Photo/Rebecca Blackwell)Mexican soldiers inside Plaza Las Americas mall following reports of gunfire in Cancun, Mexico, on January 17. As of the end of the summer, increasing violence in those places, which has largely taken place outside tourist areas, hadn’t appreciably affected tourist activity (though feelings of insecurity among residents have risen). From June to August, Los Cabos saw a 6% increase in hotel occupancy compared with the previous year, and it saw a 17% increase in passenger arrivals during the first nine months of the year. Nevertheless, violence in those tourist areas did prompt the US State Department to issue a travel warning for Baja California Sur at the end of August. Quintana Roo, home to Cancun and Playa del Carmen in the country’s southeast, was also included. At the time, Mexican officials acknowledged there were areas of concern in the country, but they also said the timing of the notice could have been a sign of political maneuvers by Washington in relation to ongoing NAFTA talks.